Let’s go the the Maldives, one of the worldwide preferred seaside spot. 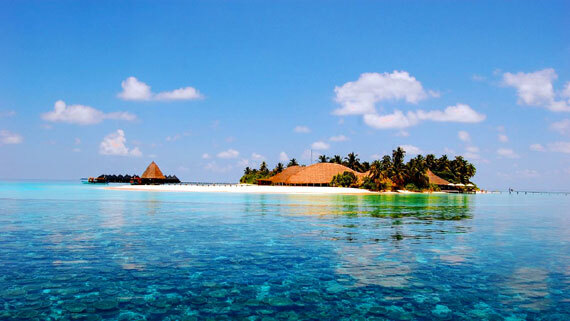 The archipelago of Maldives is situated on both sides of the equator, 700 km away from Sri Lanka. Together with the Lakshadweep, north, and the Chagos islands in the south, the Maldives are part of a vast underwater mountain front formed sixty million years ago. This particoular morphological structure is a special area for reefs and corals. The airport is situated in the artificial island of Hulhumale that is going to be renewed this year due to the growing demand of flights. The capital town, Malé, is overpopulated and the Maldivian Government is encouraging its people to move gradually to Hulhumale with discounts up to 40% on the land prices of capital, preparing also a road that links directly to the capital. Hulhumale is not only an airport, it offers the lagoon of Hulhumale where tourists enjoy a marvellous boat safari. When you will be in the Maldives you can arrange to reach your own island, in order to stay quiet, with no other people. there are 1,190 coral islands covered with palm trees and mangrove bushes, divided into 26 natural atolls and 19 administrations. Among these islands only 200 are inhabited and more than a hundred have villages. Most of these islands are small, so it is possible to cross them from one side to another in less than ten minutes. The word atoll is derived from the word ‘atholhu‘ in the Maldivian official language, the Dhivehi. It represents a belt of coral sizes and shapes, which encloses the lagoons, islands and reefs, interrupted by passages and channels. Still nowadays atolls are a mistery, we don’t know exactly how do they form. Therefore is not yet to know for sure how they in the archipelago, this adds richness to the beauty of the Maldives. It can still happen to cross from on island to the other and meet an island that has no name, is not shown in any map and has no trace of human life. Where you can stop there running naked on the sand. Or maybe get acquainted with birds and sea creatures that may not be not afraid of you, because they often are not accustomed to human presence and arrogance. Climate conditions are one of the special reason why Maldives are loved all over the world. The temperature is constant throughout the year and ranges from 29° to 32° C in daytime and 25°-26 ° C at night.